Good Morning, this is Capital Essence’s Market Outlook (the technical analysis of financial markets) for Tuesday October 16, 2018. We’ve noted in the previous Market Outlook that: “so far the oversold bounce has proved nothing as far as its staying power or as a possible trend reversal. While there is a high probability that the late-day rally will momentum but a close above S&P’s 2800 is needed before there is any real prospect of a change in the short-term downward trend pressure.” As anticipated, the S&P gyrated between positive and negative territory throughout Monday session before sold off sharply in the final hour of trading. For the day, the bench mark gauge fell .6 percent to 2,750.79. The tech-heavy Nasdaq Composite dropped 0.9 percent to close at 7,430.74. The Dow Jones Industrial Average dipped 0.35 percent to close at 25,250.55. The CBOE Volatility Index (VIX), widely considered the best gauge of fear in the market, closed flat at 21.30. Chipmarkers were under selling pressure Monday after Goldman Sachs said the Apple’s earnings could fall short this year as demand in China slows. After surging more than 36 percent in 2017, the VanEck Vectors Semiconductor ETF (SMH) declined 1.1 percent to 96.28 on the day and is down nearly 2 percent YTD, underperformed the S&P by a wide margin. Now the question is whether recent pullback is a pause that refreshes or it’s a beginning of something worse? Below is an update look at a trade in SMH. Our “U.S. Market Trading Map” painted SMH bars in red (sell) – see area ‘A’ in the chart. The first dominant feature on the chart is the rising trend line starting in early 2016. The second dominant feature of the chart is the massive triangle formation since early 2018. The early October selloff pushed SMH below the 1-year moving average, the level that offered support since the ETF rolled over in early 2018, suggesting that the triangle pattern has resolved itself into a new downswing. Last week’s downside follow-through confirmed the bearish signal. Over the next few weeks, trader should monitor trading behavior as the 2-year moving average, near 93, is tested as support. A close below that level on a weekly basis has measured move to around 75. Short-term technical outlook remains slightly bearish. Last changed October 12, 2018 from bearish (see area ‘A’ in the chart). S&P continues basing sideways using the 2016 rising trend line as support. This level was tested several times over the past years. The near-term picture remains the same. There is a consolidation within the 2770-2719 trading range, which represents digestion period in the after math of last week’s massive selloff. Money Flow measure flashed a bearish signal as it crossed below the zero line in early October, indicating a negative net demand for stocks. Momentum indicator shifted lower from oversold zone, indicating an internal weakness. 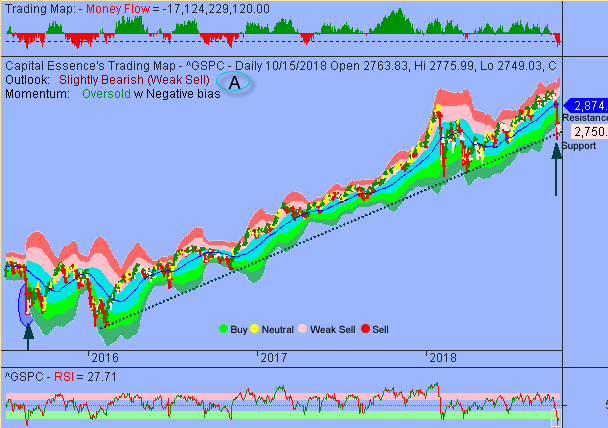 These are negative developments, suggested that the S&P might have to go to much lower level to attract new buyers as soon as it works off excessive pessimism. If the market is going to find a bottom in the near term, we want to see the S&P stabilizes and closes above 2770. Longer term, the uptrend that began in 2016 is still intact, but we’re testing that now. 2700 is the line in the sand. A close below that level on a weekly basis will break the long-term uptrend and a retest of the early 2018 lows should be expected. Short-term trading range: 2700 to 2820. S&P has support near 2700. A close below that level has measured move to 2630. The index has resistance near 2767. A close above that level has measured move to 2820. Long-term trading range: 2560 to 2930. S&P has support near 2650. A close below that level has measured move to 2560. The index has resistance near 2750. A close above that level on a monthly basis has measured move to 2930. In summary, market is in holding pattern as traders are watching to see whether or not the S&P can hold above 2700. Money Flow measure and momentum had been deteriorated, suggesting that the support might not hold for long. A failure to hold above key price level means that long-term buying pressure has finally been exhausted. On balance, we remain near term neutral/negative for S&P as we believe market vulnerable to some downside retracement over the short-to-intermediate term.